Great marketing is the difference between a business that thrives and one that sinks because it is overshadowed by competitors. Mitchell 1 has the answer to this problem. There are four things that your business needs to do well in order to keep up in this day and age of high tech habits. Let us take you to the next level of auto repair marketing. From the time a prospective customer arrives on your shop’s home page, your website only has about 30 seconds to convince them to stay longer. Today, the majority of customers rely on the Internet to find automotive service providers. Once they land on your website, you then have to wow them into believing that they don’t need to look elsewhere. Your shop is awesome. You know it, but does your website also show it? This is why marketing your repair shop is of utmost importance. Just as a shop with broken windows and misspelled words on the outside does not give a good first impression, your website also needs to represent you well. What buttons, key words, images, and icons communicate to a customer that you are not just professional, but competent? 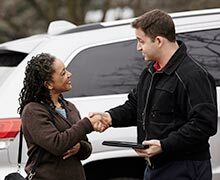 The customer is deciding whether to entrust their car to you. Your website should make them feel confident in your professional expertise. Smartphones have changed the way people receive information, whether it be news, entertainment or great deals. If your shop is unable to establish its presence online and on social media such as Facebook and Twitter, then you are fighting an uphill battle against your competitors. Mitchell 1’s Web and social media services will give you peace of mind that your customers will find your business in the vast expanse of the Internet. So you did a great job fixing their car. But will they remember you the next time something breaks down? Or will they go another shop that is more convenient or that gave them a better deal? Keeping in touch with your customers helps you become a part of their lives. By sending emails and posting on social media, you stay engaged with them. Sending them seasonal greetings, useful reminders and discounts will help foster loyalty. Grow your business by automating your marketing, reputation management, social media and customer communication efforts.